French jeweler Mauboussin has launched Mauboussin Pour Lui, a new spicy woods fragrance for men. Mauboussin Pour Lui was developed by perfumer Violaine Collas; the notes include ozone, lavender, cedar leaves, absinthe, anise, caraway, amber, ebony wood and oak moss. 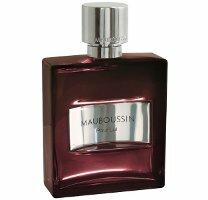 Mauboussin Pour Lui is available in 50 and 100 ml Eau de Parfum. Like the bottle, like some of the notes. Not so sure about the Ozone though and how that would translate… Worth a try though. I never see Mauboussin in the US, although I know they’re sold here. So probably won’t see this one either. Ditto on the Ozone, everything else sounds (smells) good. Seems to me they are trying for an aquatic chypre. Has that already been done? Frequently the notes listed are not detectable in the fragrance, so for the haters I guess you can hope for undetectability in the ozone. Beautiful bottle and liquid! An aquatic chypre? Would that be something like Cool Water. *shudder*. One that comes to mind as an aquatic chypre was Roxana Villa’s GreenWitch, which is a chypre with a seaweed note. I’m sure that’s not the only one out there. I want this; where did I buy it? So far as I know it is not here yet. Those little freestanding perfumery stores tend to have things Mauboussin and Balmain and Worth, the brands that don’t get sold in department stores or Sephora. If you have a place like that near you, that’s where I’d look. Yes, I know! I just never go in those stores. But thanks. Betcha the mall kiosks will have it too, eventually. A couple dept. Stores in Canada carry Balmain, but not the other fragrances.